The AirSine™ has won the Writer's Choice award, at Positive Feedback! If you own a high-resolution system, and have already traveled down the upgrade path with your electronics, the new "Gold Label™" series of audiophile cables from VH Audio may just be the final piece of the puzzle for you to achieve musical playback bliss. The first product to be included in the new Gold Label series of the VH Audio cable lineup is the AirSine AC Power Cable. The Gold Label series are 'cost-no object' products that utilize state-of-the-art technologies and processes, some of which have never before been used in audio cable manufacturing. No single company had all the necessary expertise and resources to make the raw cabling 'in-house', so VH Audio researched, interviewed and cherry-picked multiple companies to manufacture the raw cabling in several different phases. Although this certainly costs more, the result of this process is a no compromise product that we feel will redefine the limits of performance, while still being priced well below other elite products in the marketplace. 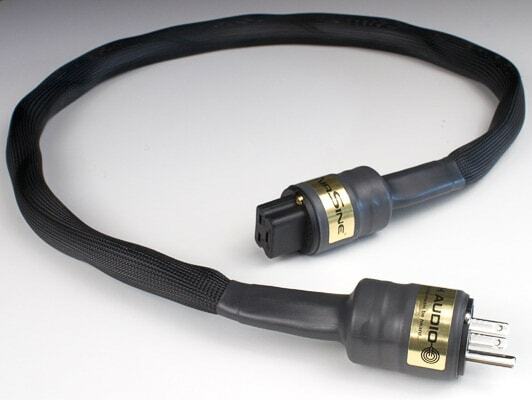 The AirSine power cable is VH Audio's "reference" design that may be used with any analog or digital component. * An optimized strand-count & lay of oxygen free high purity copper wire is utilized for both the 'hot' and 'neutral' conductors. This provides greater resonance control and higher conductivity, resulting in a dead-quiet noise floor, as well as a grain-free presentation. * Hot and neutral conductors are uniformly insulated with VH Audio's new Airlok™ dielectric to achieve extremely low dielectric absorption, and a dielectric constant of LESS than 1.5. By comparison, the dielectric constant of solid fluoropolymers, such as DuPont PTFE, FEP, and, PFA (referred to as Teflon®, when licensed from DuPont) is 2.1. A perfect vacuum is 1.0. The result is faster transient response, better overall coherence, and increased resolution, without being sterile or analytical. * A cotton filler material is utilized inside the core to dampen vibrations and augment mechanical stability. * A symmetrical, noise canceling, and self-shielding geometry is utilized to further reduce background noise and minimize interactions with externally-induced fields, and other cabling in your system. * PTFE film is wound around the cable core at precise tension, in order to restrict relative micro-movements of the conductors, which may otherwise smear the sound. * A state-of-the-art vibration dampening compound is applied at high pressure to conform around the internal conductor bundle. This further restricts relative conductor movement and dissipates both internal and external resonances, lessening the mechanical feedback of vibrations into your component chassis. This is especially important if your equipment uses vacuum tubes or is sensitive to chassis vibrations. * Cryostage™ Deep Cryogenic treatment process is performed at various phases of cable construction. The result in a subjectively wider dynamic range, better phase coherency, and even lower noise floor. * VH Audio's pioneering Spaced Counter Spiraled Ground™ topology minimizes capacitive coupling of hot/neutral conductors to safety ground, optimizing yet another area where noise may enter the system. * The safety ground wire has been specially optimized by employing a tremendously thick, yet very flexible vibration dampening dielectric. The internal strand count and configuration has also been refined for resonance control and maximum performance. The AirSine is terminated with Furutech FI-28 series Rhodium connectors. Furutech FI-50 connectors are also available, at additional cost. 20 amp IEC's may also be fitted upon request. The entire cable is 'conditioned' after final assembly on an 'AudioDharma Cable Cooker Pro'. This means much quicker ramp-up to maximum performance in your system. This means it will take four additional days after construction before your cable(s) may be shipped, as all AirSine's are built to order. Like all VH Audio wire and cables, this product was developed by Chris VenHaus after extensive listening tests over a period of several years, and is ONLY available at VH Audio. As with all VH Audio wire and cable, this wire has been manufactured to VH Audio's specs in the USA, and is only available at VH Audio. If you aren't delighted with your purchase within 60 days of purchase, VH Audio will cheerfully refund your purchase price.